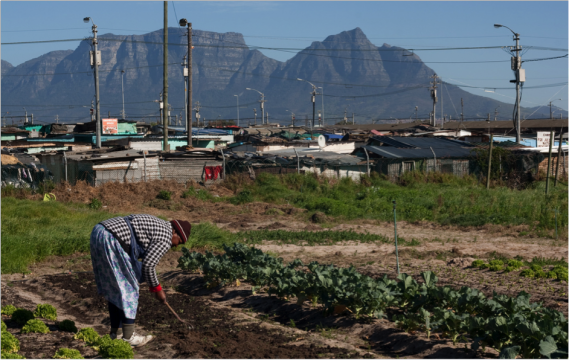 This case study focuses on the climate dimensions of land use management and zoning in a suburb of the city of Cape Town, South Africa, called Philippi. It follows each of the steps laid out in the guidance on using climate information to support adaptation planning and policy-making, exploring the available climate information in light of the planning question: From an urban climate resilience/adaptation perspective, should Philippi Horticultural Area remain in use for vegetable production, or should it be rezoned from rural to urban and used to build low-cost housing? Taking such a decision requires information on the viability of crop production under changing climate conditions and on the nature of flood risk posed to current and prospective residents. Comparing observed rainfall data with that projected for the period 2040-2060 suggests that flood risk is likely to stay similar to what it is now, or even reduce slightly. The risk of flooding in Philippi is currently high, marked by the regular need for disaster response interventions, which means that adaptation is urgently required. The fact that the climate projections show a slight decrease in winter rainfall means that adaptation choices and investments can be designed around the current range of rainfall conditions and associated levels of risk, without concern that these will be exceeded in the coming decades. However, rainfall is only one component of flooding. Ground surface cover, groundwater levels and drainage capacity are also critical determinants. Climate data alone cannot tell us about these dimensions of flood risk. An assessment is therefore required to consider the possible flooding implications, as well as the drainage and construction requirements (and associated costs), of a switch from farmland to the impervious surfaces of houses and roads. The temperature data shows a clear and considerable increase in monthly average maximum temperatures projected by the middle of the century. Even more significantly, the data suggest a sizable increase in the number of very hot days (exceeding 32°C), which poses a threat to vegetable crop yields in Philippi and thus to the viability of farming in the area, unless investments are made in adaptation measures such as installing shade cloth tunnels and increasing irrigation capacity. The viability and feasibility of implementing such measures would need further assessment. To see the full analysis and supporting climate information read the accompanying article, or view the 8-step guidance on using climate information to support adaptation planning and policy-making.